Khoo effectively weaves the four narratives together to create a binding and grittily realistic commentary on the banal and everyday tragedy of Singaporean life, wherein communication between and among people breaks down and fails. The tragic condition is mostly played out through communication, its displaced form as well as its absence. Loneliness, pain and suffering plague the characters as they reach for the unattainable, only to be stifled by constricting social forces, and their aspirations and desires thwarted and unfulfilled. Where in the end, Khoo’s film does illustrate a general sense of redemption in a poignant show of how suffering is embraced, hope, however, ultimately remains deferred, a blur that eludes real understanding and grasp. Khoo’s narratives act as a commentary against the social forces that oppose and seek to control the agency of the individual. In ‘Spirit’, the camera provides a depth to the character of the otherwise nameless and silent young man. Panning around his room, it focuses on several action toy figurines, a video camera, some CDs and comics. On top of that, the young man wears an AstroBoy tee shirt. His possessions work as a symbol of play and creativity. If the young man is to be conflated with play, his suicide will similarly equate with a lack of room in Singapore within which play may exist. His asthma, throwing up of blood and finally, his suicide are cumulative and manifest responses to, and proofs of the asphyxiating pressures of society. Pain and suffering is made physical as social forces suffocate, such that death seems to be the only viable way out. The young man, in unable to attain a fit within the rigid confines of society, is ultimately victimised and sidelined in the system. Tragedy is when Meng legitimises the very system that oppresses himself. The authorial sanctification that he devotes himself to building is nothing but a façade that hides hypocrisy. Meng’s ‘double life’ and repressed desires belong to the unattainable and the unrealisable, played out in his ironic arrest as he creates a drunken nuisance out of himself at the playground in the middle of the night, agonisingly crying out his sister’s name. The tragic condition is also created when expectations and aspirations fail to be met with, perpetuating an imagined reality that offers little alleviation of any sense of pain and suffering. In ‘San San’, the use of silence and speech alike pointedly exemplifies the breakdown of communication between people. San San’s unrelenting silence is juxtaposed against the memory of the voice that belongs to her dead mother, one that constantly berates her in Cantonese for being dirty, lazy, fat, and ugly. Ironically, the voice that speaks up does not provide for any real communication. For the most part of the film, the audience does not get to hear San San speak, except for a few lines in an exchange with Rachel, the highly successful and wealthy daughter of her mother’s previous employer; even her crying occurs in silence. Her entire existence is dominated by a clamming up of her feelings and emotions, muted by what she is unable to be. Incapable of living up to her mother’s expectations, San San continues to be haunted by her displaced presence, finding no peace or conciliation despite her death. Her tragedy is perpetuated precisely her pain never gets articulated; repression in the form of this displaced communication never ceases and her only companion is that of her critical dead mother. Like San San, the narrative of ‘China Bride’ features Ah Gu and his China bride, Lili, as victims of their own failures to meet with expectations or have their expectations met. Lili’s preconceptions of marrying into a cushy life in Ah Gu and Singapore does not materialise; instead, she feels like she has been “duped” into it. In the same vein, Ah Gu’s dream of marrying a young, pretty woman who truly loves him does not map onto reality even though he thinks that giving his all is an assurance of love; her heart irretrievably remains with her lover back in China. His marriage with Lili was built on the expectation that the other would provide for and fulfil the other party’s individual needs, which subsequently does not get realised. Instead, each of them sink further into a mutually unhappy existence. In front of other people at the coffeeship, communication between the two takes on a show of togetherness’ in truth however, they engage in interspersed shouting, quarrelling, pacifying, and fighting. The maintenance of this superficial relationship is also fragile maintenance of the pain and suffering, exemplified in the scene where Lili takes out a photo of herself and her lover and masturbates. The camera zooms in to show a close-up of her face as she starts to cry, tracing her immense emotional anguish. Through the mirror, the audience sees her as she really is – a broken figure, whose physical pleasure is ironically juxtaposed with pain.Material gratification masks her pain, just as her role as Ah Gu’s wife is but a façade that obscures her true desires. The characters of 12 Storeys may be seen, as a whole, to be on the constant search for an affirmation of their own existences. Khoo provides an ironic reality that debunks that desire, and he shows it through an undermining of dominant Singaporean social discourse. What ties the four narratives together is their common participation in a culture that promotes apathy and dispassion. For instance, Meng and San San’s paths cross when they stop at the playground. In the following frame, the playground slide separates both figures, and foregrounds their spatial and relational division. Each casts the other an uncomfortable glance before resuming an un-acknowledgement of each other’s presences, most apparent when Meng then turns his back to San San so that he can continue with his exercise without having her being there disrupt him. They are neighbours only in the sense that they live in the same block of flats, actually walled off from each other. Later, the young man from ‘Spirit’ and San San get into the same lift. He glances at her, and this time it is her who shifts uncomfortably to face the other side of the lift. The young man then follows San San and sees that she is about to jump off the building, a leg already cast over the parapet. He keeps silent, but she eventually realises that he is watching her, so she pulls back from her suicide attempt. The man quickly walks away, as though having witnessed something taboo. He marginalises San San and her suicide attempt as that of the unspeakable and fails to reach out to her. The connection between both characters has been established but left unacknowledged. This lack of communication thus destroys any possible sense of meaning and hope. In the same way, Ah Gu is also denied access to true communication. His friends at the coffeeshop appear to be his amiable buddies, yet the audience sees that once Ah Gu leaves them, their conversation turns to ugly, backstabbing gossip revolving about him. Ah Gu is but merely one of the few topics that drives ‘coffeeshop talk’; he remains detached from any real, inter-personal engagement with the people in the neighbourhood. The communication that exists between him and his friends is defaced and failed. It is evident then, that the multi-narrative strand hangs by a common desire towards the unattainable and its subsequent elusiveness. Tragedy occurs when real communication never gets realised within the urban condition; it consistently eludes and is rendered unattainable to the isolated individual. However, redemption seems to arrive at the end of the film, when San San again contemplates suicide over the parapet of the HDB building, but the ghost of the young man appears and embraces her. Where at San San’s previous attempt at suicide, the young man refused any form of involvement, he now tries to do what he thinks will fix the bleakness of San San’s existence – by connecting with her. With touch, relational communication is reborn. For the young man, his suffering in death bears enlightenment, an element which he now possibly feels can be shared with San San. The audience does not get to see whether San San eventually jumps, but the camera does move into an extreme close-up shot of her eye as it opens, a scene symbolic of an awakening and the dawning of new hope. Yet, the sense of hope is deferred, precisely because the audience is denied the knowing of San San’s course of actions. Does her eye really open to hopeful revelation, or is it a decisive move towards ending her misery? Hope is deferred, suspended, and caught within the liminal. The film further asserts a sense of ambiguity as it ends with shots of the HDB flats, homogenous and unchanging, as when the film opens. Evidently, life goes on, another day arrives, and time stops for no man nor pain. The tragic condition of the common man is located within the everyday as well as the ‘everyone’, its significance merely a speck, one storey within the greater scheme of flats and houses. The search for the unattainable merely results in an assertion that the unattainable is just as it is, out of reach. 12 Storeys. Dir. Eric Khoo. Zhao Wei Films, 1997. Film. 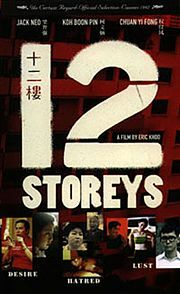 “12 Storeys”. Zhaowei.com. Web. Accessed 8 April 2011. “Films from Eric Khoo”. Asian Film Archive. Web. Accessed 8 April 2011.
it seems Meng is a subject of the space he lives in. the portrayal of the HDB community in the film is completely absent. there is suggestion that the four storylines occur within the same block, with the characters from different stories crossing paths with each other. however they never talk to each other directly (except for the coffeeshop uncles chatting about shan shan as ah gu overhears, and talking about the guy that commits suicide at the beginning). so although these people share the same space, so all life is simply fodder for gossip. there is NO community in the hdb. even the playground meant for “community life” is the place where the guy goes crazy. basically all communal space is perverted. it doesn’t serve the purpose it sets out to do. even the opening scenes, showing individual “pigeon holes” of hdb units in a bleak blue tone at night. this shows the idea of isolation, separation of people, of lives. As compared to the well missed kampong life, HDB’s might be a less conducive space for community bonding. But I think there are many other aspects that is not shown in the movie that we see in HDB communities. Although not really looked upon, the void decks serve as simple platforms for interactions between neighbours. Though the people don’t sit at the void deck for longer than say 15mins, that short period of time suffice for neighbours to introduce themselves and have good impressions with each other. Conversations aren’t long, but having been introduced to the others, occassional short conversations and friendly greetings will be exchanged time to time whenever the neighbours do see each other at the flat or somewhere around the neighbourhood. Playgrounds too are really simple platforms for good interactions. Parents bring their children to the playgrounds to play and children would interact with each other very willingly. Maybe, given the period in which the movie was shot, neighbourhood facilities such as playgrounds and void decks with chairs and television. Nowadays the voidecks have been converted into mini function room spaces for people. It might seem that the government has set walls between people or families. With flat units looking very homogenous, colourless and very “square”. But I think a large part of the interactions people complain for depend on the people themselves. How willing are we to interact with each other. The characters in the movie have been portrayed to be quite anti-social. They do not seek help from others and thus their lonesome lives never change. But we’ve seen in our community that interaction is possible with the buzz at playgrounds, void deck and the kopi tiam downstairs. If people are not willing to interact with each other because they are afraid that at playgrounds their children might get swine flu or go to the downstairs kopi tiam because they can only go for high tea or simply because they are not friendly then its not the many homogenous flats that is the problem. But one questions. How come no one approaches these lonely figures to offer help. Maybe such walled units brought about our anti-sociable behaviour after all. Tragedy in Singaporean Film and Theatre · Five Kids' Tragic Literature Project for a module on "Tragedy"